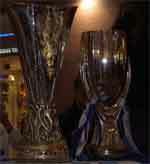 The UEFA Cup and the Champions League are associated with football in Europe. They are governed by the Union of European Football Associations. Well, Champions league is the most prestigious of the two football tournaments. While the top teams in the National Leagues play against each other in the Champions League football match, the teams that come in the third to the sixth positions in the National Leagues, play in the UEFA Cup. The best teams go to play at the Champions League, and the teams in second place vie for the UEFA Cup. UEFA is the second most prestigious European football tournament after the Champions League, which is considered to be the most prestigious tournament in the world. The teams can qualify for the Champions League only through the domestic league matches. Moreover, the current champions also qualify for the tournament directly. All together, 32 teams will be playing for the prestigious Champions League trophy. The teams that do not qualify for the Champions League, play at the UEFA Cup tournament. The first Champions League tournament was organised in 1955, after a suggestion was made by a French sports journalist, and L’Ã‰quipe editor, Gabriel Hanot. It was in 1971 that the UEFA tournaments began, replacing the Inter Cities Fairs Cup. The Champions League is a round robin, which consists of a series of group competitions running for the knockout quarterfinal round. On the other hand, it is case of single elimination in the UEFA Cup. One more thing that has to be noted, is that the winners at the Champions League qualify for the FIFA World Cup. Nowadays, the popularity of the UEFA Cup has waned, because of the success of the Champions League. 1. UEFA is the second most prestigious European football tournament, after the Champions League, which is considered to be the most prestigious tournament in the world. 2. The top teams in the National Leagues play against each other in the Champions League football match; the teams that come in the third to the sixth positions in the National Leagues, play in the UEFA Cup. 3. The teams can qualify for the Champions League only through the domestic league matches. The current champions also qualify for the tournament directly. On the contrary, the teams that do not qualify to the Champions League, play in the UEFA Cup tournament. Prabhat S. "Difference Between UEFA Cup and Champions League." DifferenceBetween.net. December 25, 2010 < http://www.differencebetween.net/miscellaneous/difference-between-uefa-cup-and-champions-league/ >. From the look of things,it’s like defenders are charged very little money in the world transfer market of football players as compered to strickers yet every position is set to facilitate winning.